Give your Super Bowl loving dog something to cheer about with the New York Giants Engravable Pet I.D. Tag! 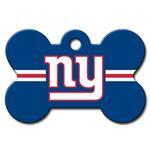 The New York Giants Engravable Pet I.D. Tag will ship to your door, ready to use. Don't let your pet leave your house without I.D. so they know how to get back. Made with a brass metal base then painted on front and back. Look for other charms to enhance your tag bling. Made in the U.S.A.
Posted On 12/27/16 by Linda W from , PA Yes, Linda W recommends this product! Very nice engraving and arrived in less than a week!!! I liked the site. I was looking for no-choke collars etc. for a 3# yorkie. They had a plethora of choices. The site is bright and fun.